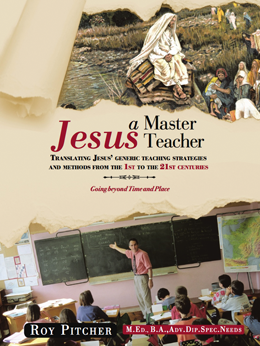 This is a book that needed to be written because there is such power in the translation of Jesus’ teaching strategies and methods into the 21st century, both for professional teachers and people generally because we are all teachers in some form or another. The book arose out of the following teaching situation. It has been – and still is – an exploration to enhance teaching. The reality is that the outcome is not a religious book but the point to highly professional practices. The origins and indicators from 2000 years ago are remarkable in their contemporary relevance, even though the contextual, cultural and conceptual differences are so great. The analysis and translation into 21st-century perspectives are described in the book that is introduced by the following ‘flier’. What was a tentative thought became a varied but settled teaching style that is eminently adaptable and capable of continued development. It might be said that this has been a ’mustard seed’ experience. But what does this mean and what are the implications not only for teaching RE that the subjects across the age groups and curriculum? Can it really lead to a whole school development? The book is in three distinct parts. 1. Jesus teaching from his historic roots …… A comparison of his teaching style without of traditional and progressive styles…… Identifying principles for an ultimate teaching strategy (A)….. Jesus’ teaching strategies illustrated from Matthew’s Gospel. 2. Looking at Jesus is teaching styles within social psychology…. (Leadership, perception, motivation, memory, socialisation, cognition, emotions)… An ultimate teaching strategy (B)… Teaching strategies illustrated in John’s Gospel. 3. Making it happen today…. Definitions of spirituality…. Eight, one teaching strategies related to those of Jesus…. Teaching methods in Luke’s Gospel …. Moving towards a theory of instruction and learning applied across nine subject areas and age groups. I would be pleased to come and develop the thesis in this book at any church, college, university, retreat centre etc. This is part of the not-for-profit venture and so the charge would be my essential costs plus what you judge to be an appropriate gift to the orphans and destitute street children in Uganda. The book can be obtained from Amazon or any good bookshop. It is useful to have the following information available.